Poland is one of the most dynamically developing export markets in the world. 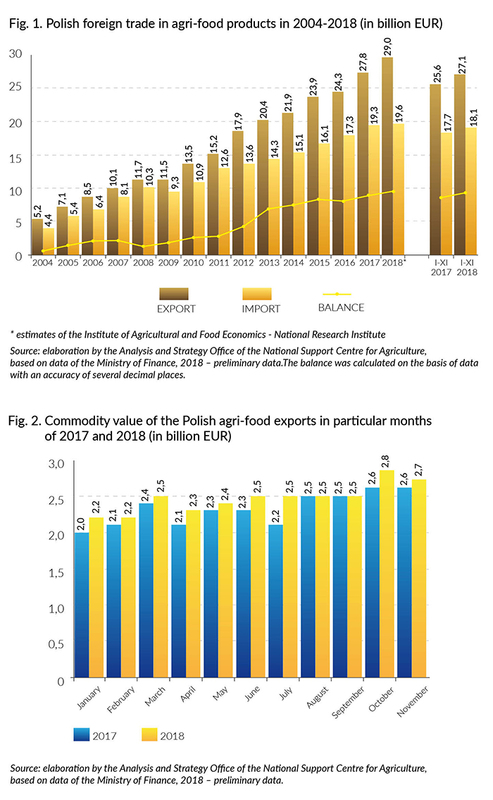 Since Poland’s accession to the European Union (EU), the export of Polish agri-food products has grown consistently, breaking new volume records each year. 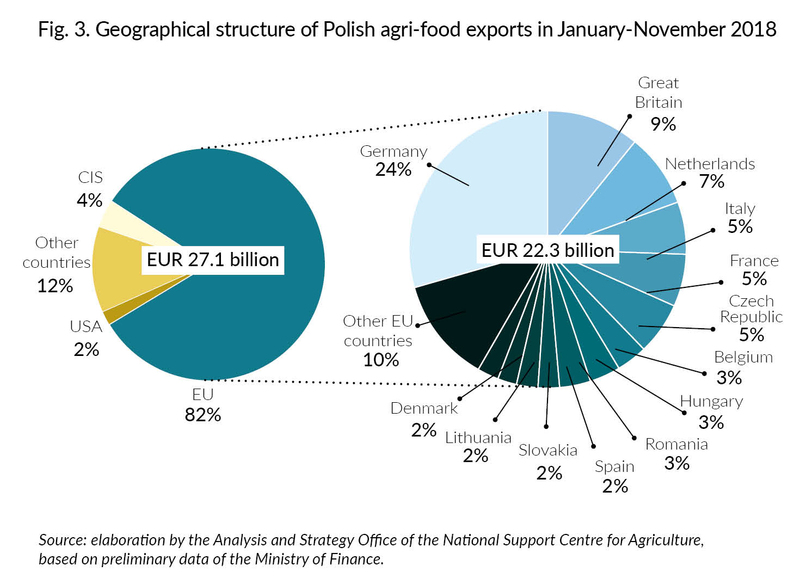 In 2017, as much as EUR 27.8 billion worth of food was exported – mainly to the EU market, accounting for 82% of the value of Polish agri-food exports. 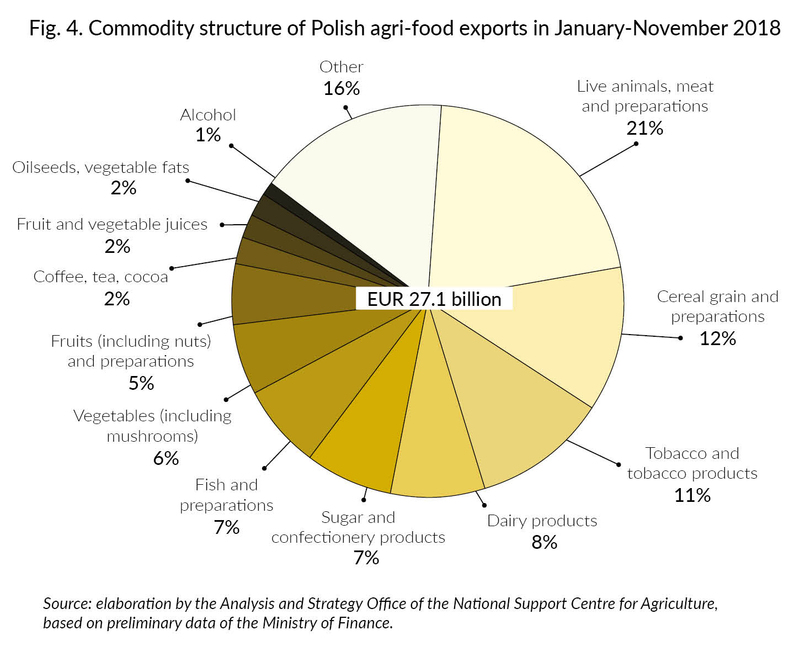 Exports to the Commonwealth of Independent States represented 5% of the total value of Polish agri-food exports, to the USA – 2%, to other third countries – 11%. The initial trade data for January-November 2018 are also satisfactory – the value of exports of agri-food products amounted to EUR 27.1 billion, thus recording an increase of 5.8% when compared year-on-year. On this basis, a further increase in agri-food exports for 2018 may be expected. Export revenues could reach a record result close to EUR 30 billion. Sugar and confectionery are an important export commodity in Poland. In 2017, they accounted for 8% of the value of Polish agri-food exports – ca. EUR 2.2 billion. 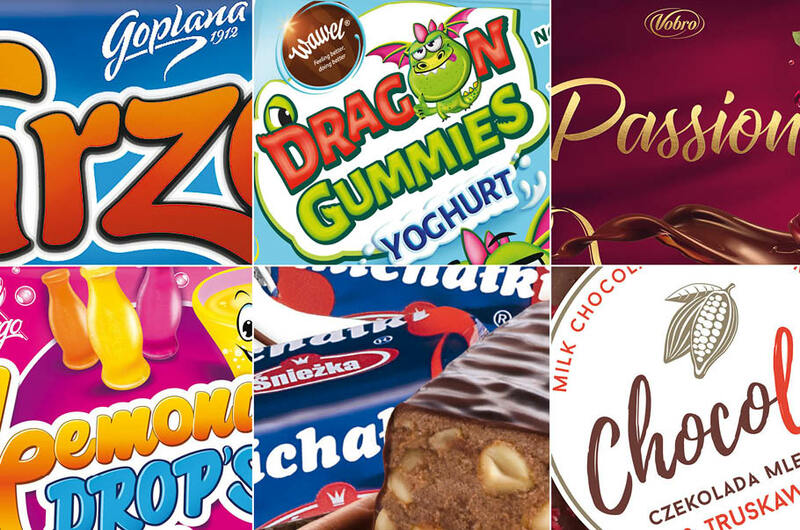 In the first eleven months of 2018, as was the case with many other Polish export food commodities, the value of confectionery exports increased. Despite the noticeable development of this industry, most Polish agri-food exports consist of live animals, meat and related products. Polish meat is highly valued by consumers in Western European countries, while also gaining more and more popularity in third countries. In 2017, these products accounted for 21% of the value of exports, ca. EUR 5.8 billion. In terms of export value, cereals and related products ranked second (12% of the total export value). Tobacco and tobacco products (11%) as well as dairy products (8%) ranked next. It is worth mentioning that, although alcohol constituted only 1% of the total value of Polish agri-food exports in 2017, Poland is a leading EU and world producer of spirits and beer. Through the export results achieved, home-produced sweets effectively aspire to become another flagship of our economy and of our country. Poland is the eighth largest exporter of sweets in the world and the fifth in the EU. It is safe to say that in recent years Poland has grown into a confectionery power. Few need convincing to enjoy the taste of traditional Polish jaffa cakes (delicje), gingerbread, chocolate-coated foams (ptasie mleczko), fudges, or chocolate-covered prunes. The value of exports of Polish sweets has grown steadily over recent years. In 2017, exports of confectionery amounted to EUR 1,732 million. A significant part of Polish export of confectionery products (as much as 79%) comprised chocolate and food products containing cocoa. The largest increases in export sales were also recorded in the chocolate category. The noticeably growing popularity of Polish sweets on foreign markets results mainly from their high quality at a relatively low price. Investments in good quality and natural ingredients are a consequence of consumer habits evolving towards healthy eating. Polish sweets have the potential to compete boldly on foreign markets with more well-known brands and appear under the producer’s own label because they stand up in terms of quality and delight the palate of even the most demanding consumers. Poland sells confectionery products to more than 130 countries. They are the most popular among EU countries, mainly in Germany and Great Britain. Nevertheless, producers are constantly looking for new sales directions. As a result, Polish sweets are already available in the United States and Canada, Africa, or the Middle and Far East. You can buy Polish confectionery practically all over the world. The countries of the Arabian Peninsula, the Commonwealth of Independent States, as well as the USA and Canada are particularly attractive export destinations for this industry. High quality aside, the popularity of Polish products also results from the experience and flexibility of Polish producers in adapting their range of export products to the requirements of foreign contractors – e.g. by modifying product recipes. Confectionery is an industry with enormous potential, especially considering the forecasted increase in sales revenues. It is predicted that in 2022 global confectionery sales will reach USD 232 billion, which would mean an increase of USD 42 billion in relation to the recorded sales revenue from 2016 (USD 190 billion). The potential for selling sweets in international markets seems unlimited. However, only high-quality products have a chance of standing out. Polish producers of sweets have an exceptional record in this regard. Consumers are becoming increasingly aware, and this includes the confectionery industry. Sweet lovers check the labels closely in their quest for healthy ingredients. Consumers increasingly choose low-processed, high-quality food, rich in nutritional value, and above all safe and healthy – that is, without chemicals to improve taste or appearance. The focus is very much on healthy eating and traditional methods of production. This does not mean, however, that consumer needs are uniform. Many factors affect diversity, such as environmental, cultural or geographical determinants. What is more, these needs evolve with changing lifestyles, which is why the key to success is to notice the changes and address them with a product range to meet customer expectations. Polish producers and exporters closely observe the prevailing trends on the markets where they plan to export and take an individual approach. The export results show that this strategy has been effective and Polish food, including sweets, consistently gains popularity. There are two main reasons for this phenomenon. First of all, the diversity of the product range offered by Polish companies, which takes into account the preferences of local consumers. Second, the reputation of Polish food. Poland’s membership of the EU means that Polish food enjoys the trust of global markets and is perceived as a safe and exclusive product in terms of taste and quality. This is related to the acumen and experience of the Polish agri-food industry, which is currently one of the most modern and technologically advanced in the EU. However, in order to convince foreign importers and, most importantly, the consumers themselves, of the value of Polish food, effective promotion is needed. The National Support Centre for Agricultural (KOWR) plays an important role in this regard. One of the key tasks of the KOWR, a government agency set up by the Polish Ministry of Agriculture and Rural Development, is to build a positive image and brand recognition of Polish food abroad. Promotional activities carried out under the „Poland tastes good” slogan are conducted in countries with high import potential, where Polish food is still absent or limited, as well as in countries where Polish food is already known, but requires further promotional support. In addition to organising the participation of Polish entrepreneurs in the largest international trade fairs and exhibition events, the KOWR organises trade missions for Polish companies and foreign importers, distributors or representatives of retail chains. There are also activities addressed directly at foreign consumers, such as tasting and cooking shows of Polish food, which acquaint the uninitiated with the richness of Polish flavours and Polish culinary tradition, as well as with the practical use of Polish products. From the point of view of the Polish agri-food sector, it is important to build awareness of the Polish brand and Poland itself on foreign markets as a country with rich agricultural traditions in the production of healthy and safe food through such multifaceted activities.